Florence Italy (Firenze Italia) is famous for its world-class art galleries and museums and its beautiful setting along the Arno River. Visitors can hike up to Piazzale Michelangelo and enjoy a fabulous view of Florence's skyline and some world-famous city landmarks. Make sure to view the paintings at the Uffizi Gallery and sculptures at the Bargello. You also won't want to miss Michelangelo's famous Statue of David at the Accademia Gallery. There are some interesting exhibits at the Science Museum, including Galileo's first telescopes. 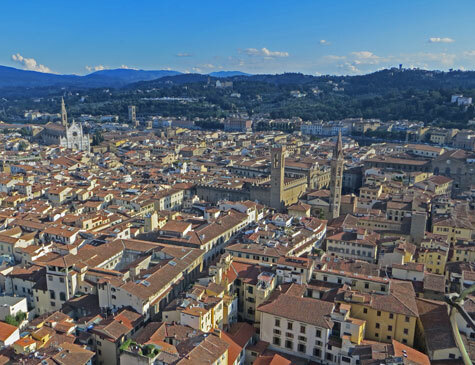 Florence Italy is located just two hours north of Rome and is served by two major airports. Hotel accommodation for all budgets is available throughout the city. Regional maps and lists of attractions by district are available on our website.